An unkempt, floppy collar at a formal event is comparable to a floppy…well… lets just say that it’s not a good thing. Don’t worry, we empathize with your collar woes, and know that sometimes no matter how much you starch and iron that shirt, somehow the collar still ends up flopping. 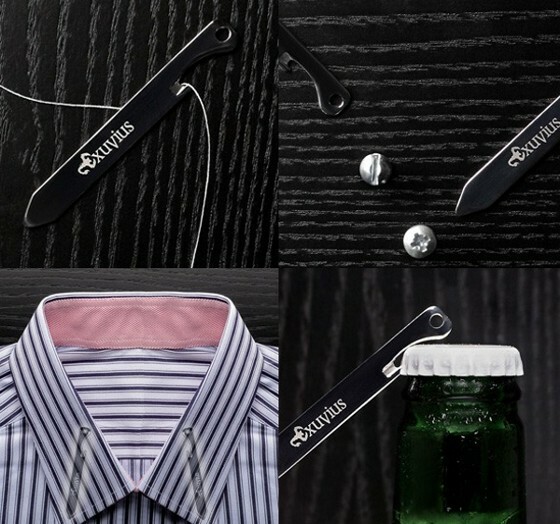 Thankfully, collar stays were invented by some genius a while ago, and even more thankfully, Titan has come out with this handy multi-tool collar stay that keeps your collar fresh, your threads cut, your bottles opened, and your screws screwed. McGuyver would’ve killed for this, fortunately you can buy a set of 4 here for a mere $50. This entry was posted in Accessories, Misc and tagged Titan Multi Tool Collar Stays. Bookmark the permalink.